key for converting a number to a corresponding percent, i.e., dividing it by 100); nonetheless, we can calculate( ) a modulo remainder with Jamie's calculator upon inputting a dividend % divisor expression into the expr field, e.g., 200 % 16 outputs 8.
key for taking the square root of a number. • The * 1 multiplications in the calc_sqr( ) function are unnecessary as the attempted multiplication of two numeric strings gives the expected product. keys for calculating other powers and roots, but there's nothing stopping us from inputting Math.pow(base, exponent) commands into the expr field and eval( )-ing them, is there? Math.pow(2, 10) outputs 1024, Math.pow(1024, 1/10) outputs 2.
key for calculating binary (base 2) logarithms. A global base_10 variable is set to Math.LN10, and the base10_log( ) function duly divides the natural logarithm of the form.expr.value by base_10 to give a common logarithm - so far, so good. A global base_2 variable should be set to Math.LN2 but is inexplicably also set to Math.LN10; as a result, the base2_log( ) function's division of Math.log(form.expr.value) by base_2 gives a common logarithm as well. Of course, sorting this matter out is no more difficult than changing var base_2 = Math.LN10; to var base_2 = Math.LN2;. key, but it is simple enough to input a Math.log(x) command into the expr field and eval( ) it. Moreover, we can use the logb(a) = logd(a) / logd(b) identity to calculate logarithms for other bases, e.g., to calculate log3(100), just enter and eval( ) Math.log(100) / Math.log(3). As shown, the 10 and 2 are subscripted via the sub element, which we can deploy in a <button> label but not in an <input type="button"> label. When the AGSC script went live at Java Goodies at the end of 1997, the current versions of IE and Netscape were IE 4.x and Netscape 4.x, respectively: the button element, with its almost-(%flow;)* content model, is supported (if a bit buggily) by the former but not by the latter. Alternatively, Jamie could have created log10(x) and log2(x) images and put them on <input type="image"> buttons although this strikes me as more trouble than it's worth. While I'm on this topic, I should note that we can today use numeric character references to put a subscripted 1, 0, and/or 2 in an <input type="button"> label, e.g., <input type="button" name="" value="log&#8321;&#8320;(x)" onclick="base10_log(this.form);"> for , but we couldn't have done so back in 1997.
keys and corresponding functions to the AGSC script, but if you don't want to do that, then you have what you need. We'll go through the trig part of the calculator in the following entry. In today's post we tuck into "Another Great Science Calculator", the next Calendars, Clocks, and Calculators (CCC) script. Authored by Jamie Beyore in 1997, the Another Great Science Calculator script codes a desktop calculator via which the user can carry out various mathematical operations, which we will detail in the discussion below. The javagoodies.com/scicalc.txt document holding the Another Great Science Calculator script code is still live as of this writing but the script's demo page shows...nothing. As it happens, two incorrectly formulated HTML comments stand in our way. HTML comments should end with a --> character sequence. The head comment contains three alien pre-> characters (the two slashes and the space that precedes them) and the body comment contains two alien pre-> characters (the two slashes); removing these characters brings the display to life. This is just an image, not the actual calculator - I'll roll out a functioning demo in due course. 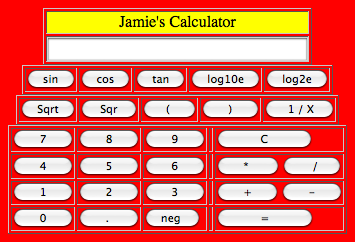 Jamie's calculator is laid out with four tables. Table #1 holds the Jamie's Calculator heading and the display/input field. • Misspellings notwithstanding, the table element does not have a valign attribute whereas its align attribute is deprecated. An align="center" setting would horizontally center the table on the page, however; in practice, all of the calculator tables are horizontally centered by a center element (whose required </center> tag is missing). • "lightgrey" is now a standard, W3C-approved color keyword: its #rrggbb value is #d3d3d3. The bgcolor="lightgrey" setting colors only a 1px cellpadding rectangle, which even the sharpest-eyed observers are unlikely to notice. • The action attribute is valid for only the form element: it has a %URI; data type and is not used to call functions. Tables #2-4 frame the calculator's operator and operand keys. Table #4 holds the remainder. The tables #2-4 code is pretty conventional and doesn't contain any red flags (for some keys the onclick setting contains an unnecessary line break but this doesn't cause any problems) so I won't burden you with it. Could we code the whole shebang as a single table, maybe put the table #1 content in a thead element and/or code the Jamie's Calculator heading as a caption element? Yep, we could do that. A form element (whose required </form> tag is missing) consolidates the tables and their controls. Although there aren't any links in the scicalc.html code, let me lastly point out that the valink in the <body> tag should be vlink. key to display the answer. (E,L,T) For exponential, logarithmic, and trigonometric calculations, the user enters a number into the expr field and then clicks the applicable operator key to display the answer. reciprocal key, which performs an arithmetic (division) operation, is like the (E,L,T) keys. key calls enter( ) and passes thereto this.form and 7, which are respectively given arg and string identifiers; subsequently, enter( ) appends string to the value of the arg.expr field. Inputting a decimal point is a bit different, and is problematic. returns NaN and not 10. Having said this, I should note that the expr field is an ordinary text input in which we can type values via a computer keyboard, and we do also have the option of inputting an unadorned . character via a . keyboard key. Still, we really ought to get rid of those decimalsign spaces, wouldn't you say? key does not convert a number to its additive inverse but instead inputs a negativesign for the purpose of entering a negative number. and are enter( )ed into the expr field à la the operand characters. Left and right parenthesis (( and )) characters are similarly available for overriding the multiplication/division-over-addition/subtraction order of operations. Arithmetic expressions are evaluated by a calculate( ) function. This is a case that really does require the eval( ) function, or at least I can't think of any other way to do what we want to do here. We'll continue our deconstruction of the calculator's functionality in the following entry.